What is the AVERAGEA Function? 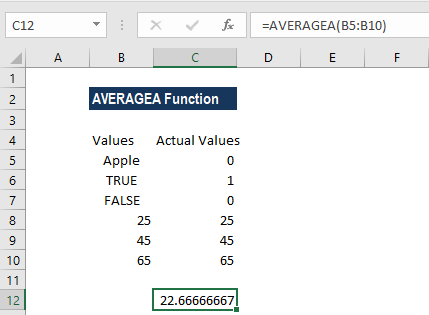 The AVERAGEA Function in Excel is a statistical function. The function calculates the average of a group of supplied values. It differs from the AVERAGE function, as it evaluates the logical values TRUE and FALSE, and numbers represented as text, whereas AVERAGE just skips these values during calculation. 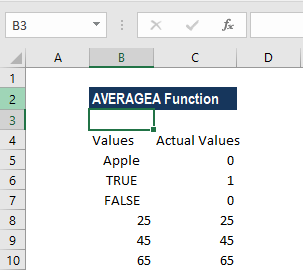 The AVERAGEA function was introduced in MS Excel 2007 and is not available in older versions. Value1 is required argument. However, subsequent values are optional. Values that are supplied can be numbers, ranges, named ranges, or cell references that contain values. Up to 255 arguments can be supplied. How to use the AVERAGEA Function in Excel? As shown in C5 – A cell with text on it would be considered as 0. As shown in B6 & B7 – A cell with FALSE in it is considered as 0 & TRUE is considered as 1. All cells with numbers would be taken as their actual numbers. The average value returned by the formula is 66666667. The formula returned is “(0+1+0+25+45+65)/6”. As seen in the table above, we can see how each argument behaves when we apply the AVERAGEA function. The function can be supplied as a single number or cell, or as an array of numbers or cells. AVERAGEA evaluates TRUE as 1 and FALSE as zero. The arguments can be numbers; names, arrays, or references that contain numbers; text representations of numbers; or logical values, such as TRUE and FALSE, in a reference. Arguments that contain TRUE are evaluated as 1 and arguments that contain FALSE are evaluated as 0 (zero). The formula will return errors when the arguments are error values or text that cannot be translated into numbers. If we do not wish to include logical values and text representations of numbers in a reference as part of the calculation, it would be better to use the AVERAGE function.